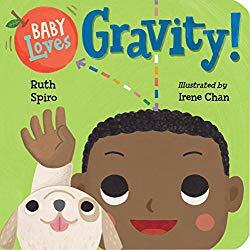 At Wrapped in Foil blog this morning, I am taking a look at the latest edition from the Baby loves Science series: Baby Loves Gravity by Ruth Spiro and illustrated by Irene Chan . Using short sentences, age-appropriate examples, and colorful illustrations the book will entice babies, toddlers and preschoolers to explore their world. “Gravity is even at the park! …and gravity helps him down. Some question the validity of introducing high-level science concepts to toddlers whose brains aren’t fully developed yet (for example, Kirkus). On the other hand, it is easy to underestimate children. I’ve had a four year old explain to me that he didn’t want to go faster than the speed of light because he wouldn’t be able to see where he was going. My feeling is that if they are interested in gravity, you will know. If they aren’t, go on to something that does interest them. Give Baby Loves Gravity a try. If nothing else, you will learn the correct vocabulary to use and be prepared to answer all the non-stop why questions you are going to get when your child is a bit older. Categories: STEM Friday round-up | Tags: Baby Loves Gravity | Permalink.